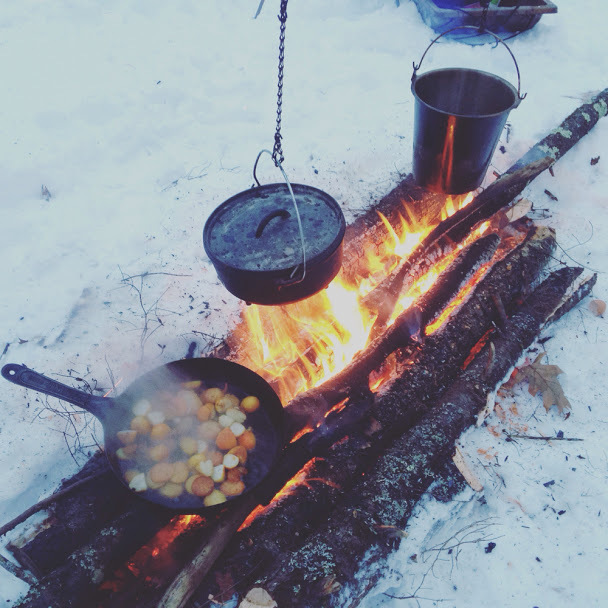 On Wednesday, July 6th from 5-7 pm we’re offering our popular campfire cooking workshop in Wolfeboro, NH, in partnership with GALA as part of our Self Reliance Workshop Series. This time around we’re adding a special treat; we’ll be joined by instructor Derek Faria of The Woodsman School. Derek’s an old friend and Registered Maine Guide who has a lot of experience cooking over fires on his courses and on remote trips he guides. We finally got him to agree to put on his instructor’s cap for this workshop and share some of his extensive knowledge with us. You’ll learn about cooking fires, pot suspension systems, dutch ovens, reflector ovens, and how to tell bad jokes while preparing and cooking. And when the food is ready, we’ll dig in! These workshops are a great deal at only $15. Bring a plate, bowl, silverware, cup and appetite! I’ll have a few copies of my book “The Woods Cook: Outdoor Cooking With A Professional Guide” available. To register or for more information, contact GALA at galacommunity.org or by phone at 603-539-6460. Wish I was there. Flying out of Portugal tomorrow. Great idea. Previous: Heaven Or Rust Pond, Not Sure Which. Maybe Both.